← GRO Index Discrepancy or Name Variations? Mary Lamb was the daughter of a grocer in Bromsgrove, Worcestershire. Robert Fleming was the son of a shoemaker from Devon. Assignment to a social class in the Victorian era is difficult, especially for those not belonging to the aristocracy or clearly working class. Those engaged in trade such as a grocer and skilled manufacturers such as a shoemaker, might be considered lower middle class or on the boundary between working and middle class. The 1841 census records both Mary and Robert working as domestic servants in the same household. This census does not distinguish between types of servants, but the near to last or last position in the list of servants suggests junior posts. Even taking into account that they were in their early twenties, this appears to be a decline in status to working class. Well, until you consider that Henry, Marquis of Anglesey was their employer and the address, Uxbridge House, Old Burlington Street was the aristocrat’s rather grand London house. The 1851 census reveals that Robert had risen to the position of valet, the Marquis’ personal assistant and a senior post in the household. Mary is found at her brother-in-law’s (James Simms who married Anne Lamb) house in Bromsgrove with her unmarried sister Sarah. Both Mary and Sarah’s occupations were recorded as housekeeper. As part of the extended family, I think it more likely that the sisters were visitors than employed by James. The housekeeper was the most senior female position the household who supervised servants and kept the household accounts. I do not know where Mary was housekeeper, but it was not Uxbridge House as that position was occupied by Jane Wilkins. A photograph album containing pictures annotated with names of several children of Charles James Fox Stanley and Frances Augusta Campbell, featured in Cartes de Visite album links to the Stanley family and Earls of Derby. Mrs has not always denoted marital status, but denoted social status in the sense of a mistress who governs servants or business. Consequently, Mrs was applied to unmarried housekeepers into the mid 20th century to distinguish their social status from the under servants. Mary Lamb is a good candidate. I can rule her mother, a Mrs by marriage, who died in 1851, but not her housekeeper sister Sarah. The form of address for a married woman using her husband’s first name appeared in ca. 1800 in the upper classes and became common in all social strata. So Mrs C. Stanley in 1853 is consistent with being Frances Augusta, the wife of Charles Stanley. In 1851, Charles James Fox Stanley and his family resided at Knowsley Hall, Lancashire, in the household of his father, Edward, the Earl of Derby. This very grand household lists 66 servants, but no housekeeper. Could Mary Lamb have been the absent housekeeper? As live-in servants, Robert and Mary could potentially have saved a large proportion of their earnings. I don’t have any direct evidence of their annual income, but Mrs Beeton’s famous book gives an idea of the range. Using the Measuring Worth website gives an indication of the modern equivalent using the 2011 average earnings for a conservative estimate. Working for high ranking aristocracy, it is possible that they achieved the upper end of the range. “hath had her usual place of abode within the said Parish of St Margaret Westminster for the space of fifteen days last past”. The choice of church was aspirational as St Margaret’s is right next to Westminster Abbey. The bride’s address, within a stones throw of the church, may have been a matter of fulfilling the residence requirement of the marriage license, rather than a permanent residence. The groom’s address is the location of Flemings Hotel. Robert and Mary’s combined resources, skills and experience made a formidable team in a business targeted at serving the aristocracy. The marriage was almost certainly a fundamental in the success of the hotel. By the time of Robert’s death in 1891, his estate was valued at £29,487 8s 2d, equivalent to at least £2.6 million using the most conservative measure. Respectable and hard working. Definitely middle class. General Register Office. Marriage Certificate. Bromsgrove, Worcester. No. 250. Simms, John & Lamb, Ann, 1843/07/13. 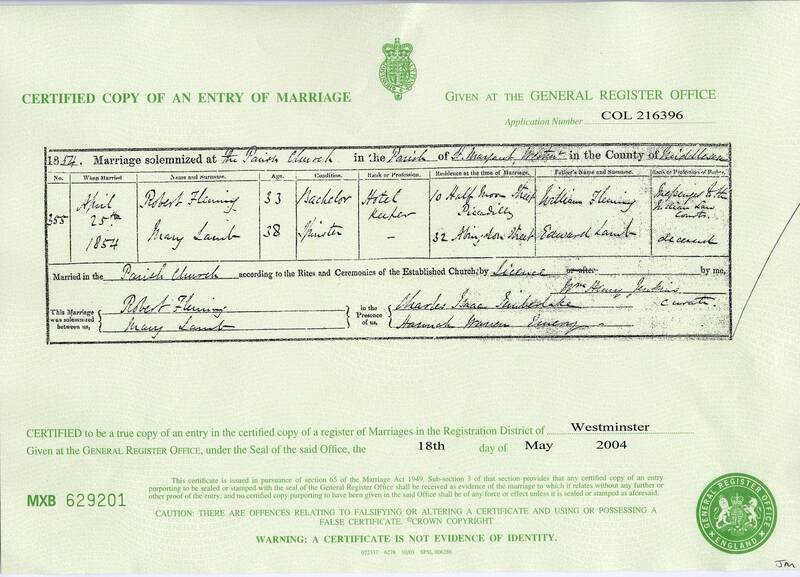 incorporating image of parish register, issued 30 January 1990. occupation of father of bride, Edward Lamb = grocer. Church of England. St John the Baptist, Bromsgrove. Parish Register. Vol. 12 Baptisms 1806 – 1814, Burials 1806 – 1815. Worcestershire Record Office, 850BROMSGROVE ST JOHN BAPTIST/9135/4/ii. (microfilm) Baptism. 1812/07/26. Mary Lamb. Church of England. Farnham St Andrew, Surrey. p.161, no 1287. Microfilm. Baptism. 1820/11/22. Fleming, Robert. .Surrey History Centre, Woking. Census. 1841. England, Middlesex, Westminster, St James, digital image. Ancestry (ancestry.co.uk: accessed 17 april 2013) Middlesex > St James > Golden Square > District 6 >image no 2 . citing The National Archives, Kew HO 017/235/5/27-28/pp.1-2. Fleming, Robert & Lamb, Mary, servants in household of Marquis of Anglesey. Census. 1851. England. Middlesex, Westminster, St James, digital image. Ancestry (ancestry.co.uk: accessed 17 April 2013) Middlesex > Westminster St James > Golden Square > District 11 > image no 15. citing The National Archives, Kew HO 107/1485/416/14. Fleming, Robert valet in household of Marquis of Anglesey. Census. 1851. England. Worcestershire, Bromsgrove, digital image. Ancestry (ancestry.co.uk: accessed 17 April 2013) Worcestershire > Bromsgrove > District 2c > image no 31. citing The National Archives, Kew HO 107/2047/122/30. Simms, John. Principal Probate Registry, High Court of Justice, Probate – Robert Fleming, York Probate, Sub Registry, 1st Floor, Castle Chambers, Clifford Street, York YO1 9RG, sealed copy of Grant of Probate, 1891/03/12. died 12 March 1891. supplied 12 January 2007. Family Division of the High Court of Justice.